I had read Pat Santarsiero’s Thursday’s Child a while back, and even though it might be a controversial book, especially for Janeite purists, I really enjoyed it, I liked the way she developed the characters and the way she created their interactions. I was, therefore, very curious towards The Last Waltz. This book is not as controversial as Thursday’s Child, it is in fact very different, and so I think it will appeal to a wider audience. 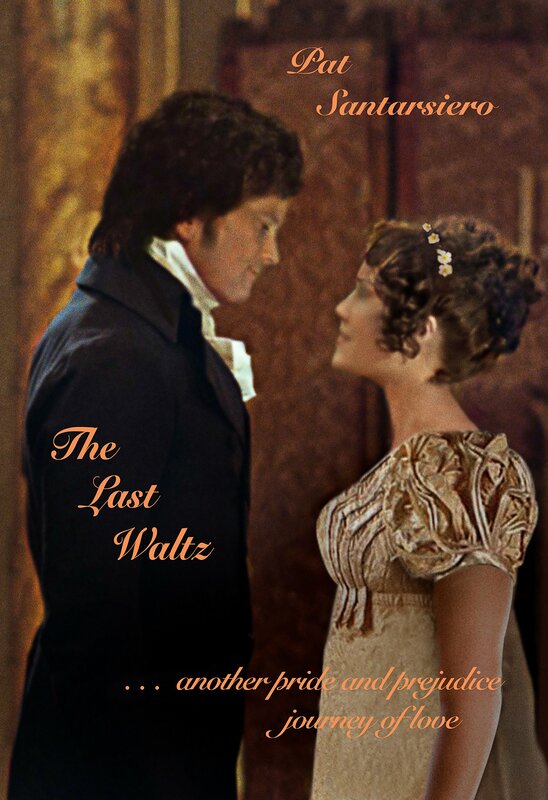 In the Last Waltz Elizabeth and Mr. Darcy briefly meet in London when she is 15 and will re-encounter each other at the Meryton Assembly. The book will follow the course of events we see in Pride and Prejudice, but of course Mrs. Santarsiero’s premise will change the events we already know too well. The incident that will change everything in the story is the carriage accident Elizabeth has after that brief encounter with Mr. Darcy, and that leaves her with a limp. This will change who she is, and those searching for playful and sociable Lizzy will not find her. This is something some people might not like. In this book we do not see the regular portrayal of our beloved characters. We see what their characters might have been if something with a considerable impact had affected them. I understand some might not enjoy this idea, but I surely do. I enjoyed seeing the way Pat Santarsiero developed Elizabeth’s character. It is very interesting to see her overcoming some of her inner struggles, just as it is interesting to see it is Mr. Darcy who keeps wanting her to dance. I also enjoyed the way some roles were reversed, namely having Elizabeth suffer for what she believe is an unrequited love. Why should it always be Mr. Darcy suffering from this? There are some very romantic scenes in this book that I enjoyed. I almost cried when Elizabeth first talked to Mr. Darcy after the Meryton Assembly and at the end of the book their dance was so romantic I wanted to re-read the scene several times. I would have prefer if there were no intimate scenes in the book as I always prefer a version without them, but it was an important part of the book that made Mr. Darcy very romantic and helped develop the story line, so it did not prevented me from liking it. I also believe their first encounter could have been more developed as it is very important in the course of the story and I personally do not feel that it could have made such an impression on all characters involved in it. But overall I really enjoyed this book. I like the way the writer lets the scenes flow. Even though this book relates one year in the characters’ lives we never feel bored while reading it. Pat Santarsiero has what I believe to be a very good sensitivity to what the readers want to read, and so the scenes are always very well balanced and described in accordance to their own importance for the readers.